The Dearborn City Hall was built in 1921 and was located at 13615 Michigan Avenue at the corner of Schaefer Road in Dearborn, Michigan. The Dearborn City Hall was a two-story red-brick and stone structure that was designed in American Colonial architectural style. The main entrance of the Dearborn City Hall was bordered in stone Tuscan-columns and featured an intricate, stone balustrade that sat above the doorway. The cornice of Dearborn City Hall featured gorgeous dentils and the roof was lined with small, half-circle windows where the attic was located. The most prominent feature of Dearborn City Hall was the beautiful cupola-dome that served as the building’s crown jewel and centerpiece. Adorning the front of the dome was a large clock that served as the timepiece for anybody walking in the area. The interior of the Dearborn City Hall featured a spiral-staircase with iron hand-rails that went all the way up to the building’s dome. The lobby, hallway, and offices featured terrazzo, marble, and granite details. The Dearborn City Hall was a fantastic building that was just as gorgeous on the inside as in was on the outside. In 2014, the near 100 year-old Dearborn City Hall closed its doors and moved to a new location that was near the other municipal buildings. Shortly after closing, plans were underway to convert the former Dearborn City Hall into art space and lofts. As of 2015, renovations are near completion and the art space/lofts are scheduled to open in early 2016. A look from the rooftop of the Whittier Hotel. The suites also featured intricate woodwork in some of the rooms. The suites on the top floor of the Whittier Hotel featured unique fireplaces. A look at one of the suites on the top floor of the Whittier Hotel. The “WHITTIER” sign atop of the hotel roof. A look at the organ from the pulpit of the church. A look at the beautiful pulpit area inside the church. A look at the pulpit area from the upper balcony. The gorgeous organ inside the church. 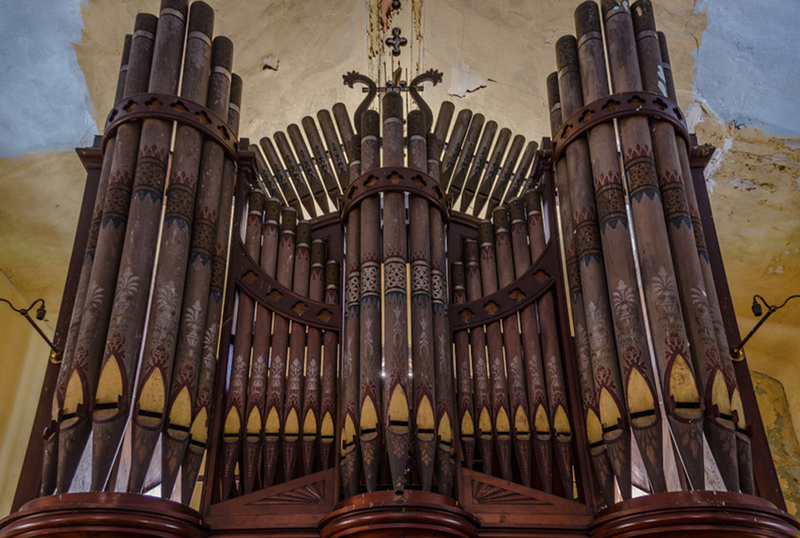 The elegant organ was truly a sight too see. A look at the sanctuary from the upper balcony. The piano and baptismal pool area. The drum kit and choir area inside the church. The sanctuary inside the church was truly beautiful. The exterior of the church before the fire. A landscape mural adorns an office wall, as a refrigerator serves as a time capsule. A “PRIVATE” office in the Farwell Building. A look at the iron hand-rails of the octagon skylight inside the Farwell Building. One of the hallways inside of the Park Avenue Building. Old medical equipment left behind inside the Park Avenue Building. A supply room full of old chemicals and outdated supplies. A look at the former laboratory inside the Park Avenue Building. A desk and typewriter sit inside the Park Avenue Building. Old books inside a former classroom inside the Park Avenue Building. Auditorium seating and a ton of plastic block letters still sit in a former office. The first floor of the Park Avenue Building featured a restaurant. An antique television still sits inside an office at the Park Avenue Building. The former restaurant featured beautiful Pewabic Pottery tile work. A view from the rooftop of the Park Avenue Building. A look at an old exam table inside of a former doctor’s office. Old medical supplies and equipment inside the laboratory at the Park Avenue Building. More outdated equipment inside the former doctor’s office inside the Park Avenue Building. An old television sits inside a vintage looking office. A look down the hallway of rooms inside the Park Avenue Building. Beautiful detail surrounds the entrance into the former restaurant area at the Park Avenue Building. A look toward the former entrance inside the Park Avenue Building. The gorgeous ceiling of the lobby inside the Park Avenue Building. The stunning detailed ceiling in the main entrance hallway of the Park Avenue Building. An exam table still sits inside a former doctor’s office. The exterior of Michigan Central Station at night. The exterior of Michigan Central Station. Coatroom and classroom at St. David School. Chalkboard in a classroom at St. David School. The alley behind St. David Catholic School. Student desks sit empty in one of the classroooms at St. David Catholic School. The gymnasium and auditorium at St. David School. Coat room for children’s belongings at St. David School. Another chalkboard in a classroom at St. David School. Boys bathroom at St. David School. A classroom missing a wall at St. David School. Classroom and hallway at St. David School. Left over chairs and desks at St. David School. School supplies at St. David School. An exterior archway at St. David Catholic School. chalkboard, desk and record player in a classroom at St. David School. Girls bathroom at St. David School. An exterior view of Highland Park Fire Station #3. The exterior of the GAR Building. The exterior and “GO & GO CO” smokestack of Goddard & Goddard Company. The exterior of Goddard & Goddard Company. The main entrance detail of Goddard & Goddard Company. The main entrance of Goddard & Goddard Company. A close up of the iron, hand-railing in the lobby at Goddard & Goddard Company. A look at the iron, hand-railing that was still in the lobby at Goddard & Goddard Company. You can also see the original ceiling and wall detail behind the drop-ceiling. Most of the administration office floor at Goddard & Goddard Company was in bad shape. A look inside the administration office and “INFORMATION” area at Goddard & Goddard Company. A close up of the machine products that was left behind at Goddard & Goddard Company. A look at one of the machinery rooms inside Goddard & Goddard Company. An old wheel-cart sits in the former main production area at Goddard & Goddard Company. The “GO & GO CO” smokestack at Goddard & Goddard Company. A look at the original, round-circular, concrete-sinks in the bathroom at Goddard & Goddard Company. A look at the stairway going from the main floor up to the second floor at Goddard & Goddard Company. A look at the main production floor at Goddard & Goddard Company. A look at one of the original, metal doors in the factory of Goddard & Goddard Company. The main production area at Goddard & Goddard Company. A look inside the main production area at Goddard & Goddard Company. A view of the ornate chandelier, upper balcony, and lower level pews from the pulpit stage. A close up of the hand-painted, ceiling detail in the pulpit at First English Evangelical Lutheran Church. The sanctuary from the lower level pews at First English Evangelical Lutheran Church. A look at the rows of pews in the sanctuary at First English Evangelical Lutheran Church. A look at the wooden-bordered, arched doorways that lead from the sanctuary to the stairway. A look into the sanctuary from one of the adjacent rooms at First English Evangelical Lutheran Church. A look at the pulpit and the pews in the seating area from the upper balcony at First English Evangelical Lutheran Church. A look at an arched-window and another chandelier that was also still hanging above the pews at First English Evangelical Lutheran Church. A look at the ornate chandelier that was hanging above the sanctuary at First English Evangelical Lutheran Church. A drinking fountain is in the midst of being scrapped. A look at a bent rim on one of the gymnasium basketball hoops. A clock still hangs above an original, wooden, display case in the main hallway at Foch Intermediate School. A drafting board in one of the classrooms at Foch Intermediate School. A wooden bench sits in the administration office at Foch Intermediate School. The exterior of the Fowler Building. The exterior of Friendly Missionary Baptist Church. A look at the beautiful, cross-carved pews and the pulpit area inside of Friendly Missionary Baptist Church. The “CHURCH COVENANT” still hangs on the wall above the organ in the sanctuary at Friendly Missionary Baptist Church. A couple of arm-chairs sit in the raised pulpit-area at Friendly Missionary Baptist Church. A look at the pews and seating inside Friendly Missionary Baptist Church. A look at a deteriorating stage in the music classroom at Douglass High School Academy. The gymnasium at Douglass School. All of the basketball hoops have been scrapped. The “FD” auditorium at Fredrick Douglass School has seen better days. The stage is falling apart and the graffiti “tagging” has gotten worse. Many of the walls in the library, as well as throughout Douglass School, have been smashed and busted for scrap. The walls of the library have fallen over, but the modern lights still hang proudly in the library at Douglass School. The former main entrance into Douglass School. A look at the chandeliers and detail of the auditorium. A view of the auditorium seating from the stage at Foch Intermediate School. A TV still hangs in a rather blue-ish classroom at Foch Intermediate School. A camera still hangs in the middle of the main entrance and hallway at Foch Intermediate School. A look at one of the other classrooms at Foch Intermediate School. Portraits of some famous African-Americans were painted on the wall in the main entrance into Foch Intermediate School. A display case and a clock hangs in the main hallway at Foch Intermediate School. Paintings of a arrows, a car, and a computer adorn the walls in the former computer lab at Foch Intermediate School. Murals of purple shapes adorn the wall inside the tool and dye classroom. A look at the tool and dye classroom at Foch Intermediate School. The fashion and cosmetology classroom at Foch Intermediate School. A look at the home-economics classroom at Foch Intermediate School. A look at the original, beautiful, wood-paneled bookshelves in the library. A look at the library inside of Foch Intermediate School. A look at the original, beautiful fireplace in the library at Foch Intermediate School. The student lockers for the “ROTC” program at Foch Intermediate School. A look down the hallway of lockers at Foch Intermediate School. 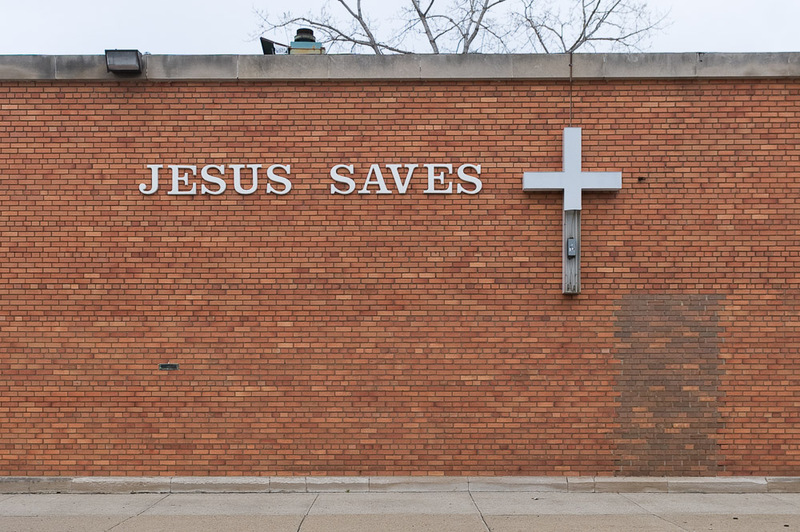 The exterior of Faith Deliverance Ministries Church. A look at the pulpit from the seating at Faith Deliverance Ministries Church. A look down one of the hallways at Foch Intermediate School. A look at the details in the interior of the auditorium. The auditorium form the lower level. A look at the design details in the interior of the auditorium at Foch Intermediate School. A side view of the auditorium at Foch Intermediate School. A view of the chandeliers and window detail inside the auditorium at Foch Intermediate School. A view of the auditorium at Foch Intermediate School. A view of the auditorium from the upper balcony at Foch Intermediate School. The swimming pool at Foch Intermediate School. It still had the power on back then. A look at the swimming pool at Foch Intermediate School. A look at the two-level style gymnasium at Foch Intermediate School. The gymnasium at Foch Intermediate School was a two-level style with a track around the second level. A look at the basketball hoops in the gymnasium at Foch Intermediate School. The gymnasium at Foch Intermediate School. A look inside the cafeteria at Foch Intermediate School. The cafeteria at Foch Intermediate School. The north entrance detail at Foch Intermediate School. The south entrance detail at Foch Intermediate School. The exterior of Foch Intermediate School. The façade detail of the former Detroit Fire Department Engine 36. The exterior of the main entrance into the former Detroit Fire Department Engine 36. The exterior of the former Detroit Fire Department Engine 36. A look at the original wood-paneled entrance into the dormitory area at Detroit Fire Department Engine 36. The Detroit Fire Department emblem is centered on the door window of the dormitory entrance at Detroit Fire Department Engine 36. The sinks and mirrors of the bathroom at Detroit Fire Department Engine 36. A look at the dormitory room in the upstairs of Detroit Fire Department Engine 36. A fan still hangs from the ceiling and a clock still hangs above the doorway in the kitchen/dining area at Detroit Fire Department Engine 36. The two garage doors at Detroit Fire Department Engine 36 that was used for the fire trucks to pull in and out of. The chief’s office at Detroit Fire Department Engine 36 had been cleaned out. The main garage at Detroit Fire Department Engine 36. A look at inside the main garage at Detroit Fire Department Engine 36. A look at the beautiful fire place that was in one of the offices at Detroit Fire Department Engine 36. A mural is painted above the doorway and a gorgeous, brick fireplace in this office at Detroit Fire Department Engine 36. The exterior of Detroit Fire Department Engine 27. A beautiful, wooden door with hand-carved, fire-shields is barely hanging in the doorway leading upstairs at Detroit Fire Department Engine 27. A make-shift hockey arena in the attic of Detroit Fire Department Engine 27. The fire fighters of the former Detroit Fire Department Engine 27 had made the attic into a make-shift gymnasium and a hockey arena. An old fire alarm still hangs in the doorway at Detroit Fire Department Engine 27. The office at Detroit Fire Department Engine 27. A pool table still sits in the recreation room at Detroit Fire Department Engine 27. A painting still hangs above a leather chair and above the gorgeous, wood-paneling in the upstairs of Detroit Fire Department Engine 27. Hand written notes and names of fire fighters adorn the wall from the “LAST 24 DAY” for Detroit Fire Department Engine 27. The last day was October 1, 2006. File folders still hang on the wall in the entrance to the kitchen at Detroit Fire Department Engine 27. The two garage doors for fire trucks at Detroit Fire Department Engine 27. The red “DETROIT FIRE DEPARTMENT” door at Detroit Fire Department Engine 27. A look at one of the original, red, wooden, French-doors at Detroit Fire Department Engine 27. The auditorium at Dixon Elementary School. The library at Dixon Elementary School. A painting of “WELCOME TO DIXON” was on the wall in the main hallway at Dixon Elementary School. The student lockers at Dixon Elementary School still had dinosaurs and reptiles painted on them. The curved-wooden bench in the kindergarten classroom at Dixon Elementary School. A look at the curved-wooden bench in the kindergarten classroom at Dixon Elementary School. The exterior of Dixon Elementary School. A look at the exterior Art Deco design of Dixon Elementary School. A view of the auditorium seating from the stage at Dixon Elementary School. The student lockers were painted with murals of children playing. Above the lockers, a mural of Egypt, musicians, and more children playing adorns the wall. A mural of a scroll with the description of the “LIVING THE AFRICAN-AMREICAN EXPERIENCE” was hand-painted above the classroom entrance at Dixon Elementary School. The basketball hoop is missing in the gymnasium/cafeteria at Dixon Elementary School. A painting of “WELCOME TO DIXON” adorns the wall in the main hallway at Dixon Elementary School. The drinking fountain has been scrapped and is laying on the ground. A mural of “WELCOME TO DIXON” was also painted on the exterior wall at Dixon Elementary School. The Art Deco details on the entrance exterior at Dixon Elementary School. A look at the Art Deco exterior details at Dixon Elementary School. A look at some of the chemistry supplies that were left behind in the science laboratories at Detroit Urban Lutheran School. The exterior of the former McKerrow Elementary School. A look at the textbooks that were left behind in the bookstore at Detroit Urban Lutheran School. A globe sits on the back table and in the foreground of all the art supplies in the art room at Detroit Urban Lutheran School. A globe sits on a table, a clock still hangs on the wall, school posters still stick to the wall, and a projection screen is ready to go in a classroom at Detroit Urban Lutheran School. A look down the main hallway at Detroit Urban Lutheran School. A painting of some students was in the entrance to one of the classrooms. A look at the librarian desk and the library at Detroit Urban Lutheran School. 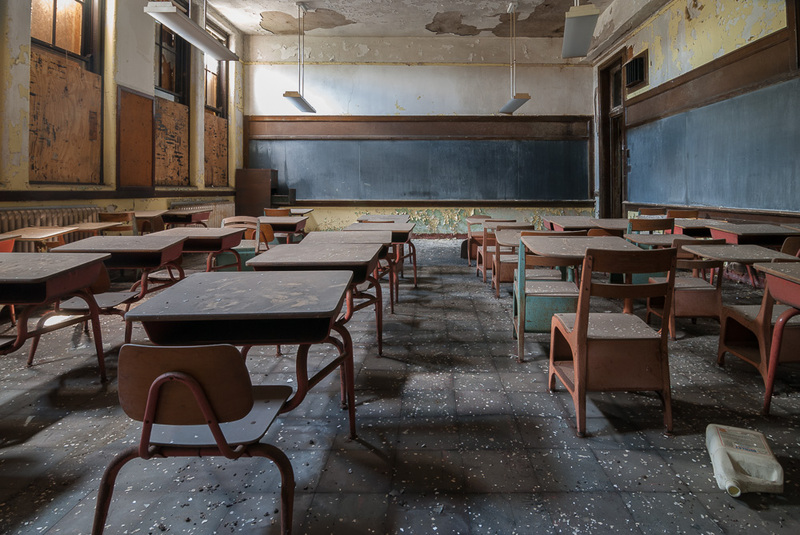 A look at the desks and chairs that were still in the library at Detroit Urban Lutheran School. A look shelves of books and a pile of reading books on a table that were all left behind at Detroit Urban Lutheran School. The library card catalog at Detroit Urban Lutheran School. A look at the “NON-FICTION” section in the library at Detroit Urban Lutheran School. A look at all of the books that could have been re-used. A look at the library at Detroit Urban Lutheran School. A look at the chemistry laboratory at Detroit Urban Lutheran School. Most of the chemicals and supplies were left behind. Anatomy dummies still sit on the teacher’s desk, as more science equipment and supplies sit on the shelves behind it. The exterior of East Grand Nursing Home. A mural of some “old-school” gangsters adorns a door at East Grand Nursing Home. A pink waiting area and medication window at East Grand Nursing Home. A statue of Lady Liberty is painted on the wall in the doorway to the recreation room at East Grand Nursing Home. Chairs still sit in the former recreation/television room at East Grand Nursing Home. A look at the nurses station inside of East Grand Nursing Home. 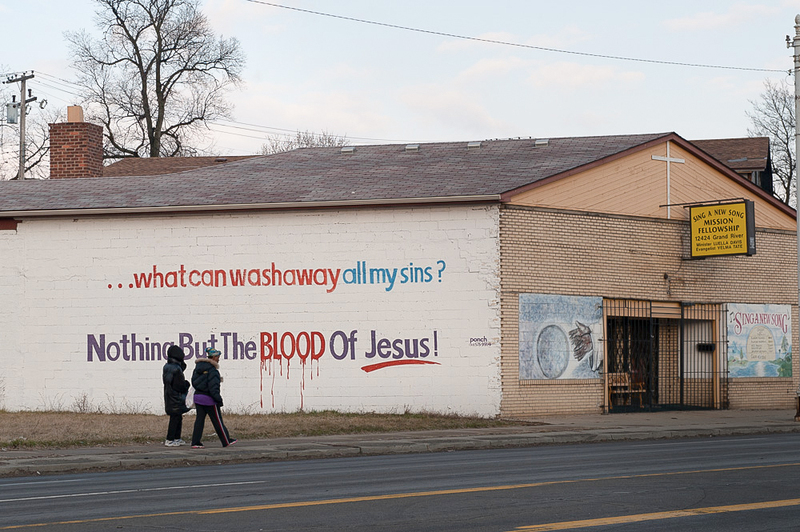 A hand-painting of Jesus Christ was on one of the offices at East Grand Nursing Home. A choo-choo train was painted on the wall in the main stairway at East Grand Nursing Home. Air Jordan was also one of the many murals and paintings that could be found throughout East Grand Nursing Home. A smashed piano sits in pieces near the stairway in the main lobby at East Grand Nursing Home. This circular-room at East Grand Nursing Home featured a rainbow bench, mattresses, and a dresser. A hand-painted tribute to 9/11 adorns the door in the main entrance and lobby at East Grand Nursing Home. A bench still sits in the main lobby at East Grand Nursing Home. The stairway was still the original wood, but had suffered scrapping damage. The fireplace had also been scrapped. A look at the main entrance and lobby at East Grand Nursing Home. You can still see some of the original detail along the ceiling molding. A look at a rainbow-colored bench and a mural of “DOG HEREOS” in this pro America-themed room at East Grand Nursing Home. A look at some of the original, wooden-detailed, closet doors that had been painted with an American-Indian. A mural of Martin Luther King Jr. was in this room at East Grand Nursing Home. This office at East Grand Nursing Home had an American flag and portraits of Dr. King. The original, detail can be seen in the crown molding inside this office at East Grand Nursing Home. An arched-doorway leads to a little porch-area at East Grand Nursing Home. You can again see some more original detail in the crown-molding here. A wooden, saloon-style door still sits on the stall in the bathroom at the former Detroit Fire Department Engine 38. A look at the locker room and weight room for fire fighters at the former Detroit Fire Department Engine 38. A look at the original, Pewabic Pottery glazed-tiles that were used in the gorgeous design of Detroit Fire Department Engine 38. A painting still hangs in this bedroom, but the sink has been damaged by scrappers. A fire hydrant and a “lady photo” still hang in this porch-area at the former Detroit Fire Department Engine 38. The main garage at the former Detroit Fire Department Engine 38. A look at the famous “watching eyes” posters for arson fire that still hang in the windows at the former Detroit Fire Department Engine 38. A look at the main garage at the former Detroit Fire Department Engine 38. The side entrance and exterior detail of the former McKerrow Elementary School. A bulletin board with photos of “fallen heroes” still hangs in the conference room at the former Detroit Fire Department Engine 38. The auditorium at Detroit Open Elementary School. A look at the Detroit Open logo at center-court in the gym. A look at the gymnasium/cafeteria at Detroit Open Elementary School. A cafeteria bench-seat sits in the middle of the gym floor at Detroit Open Elementary School. A look at a mural of a rainbow that was in the main entrance to Detroit Open Elementary School. The kindergarten room at Detroit Open Elementary School featured a brick fireplace, a curved wooden-bench, and a climbing platform. 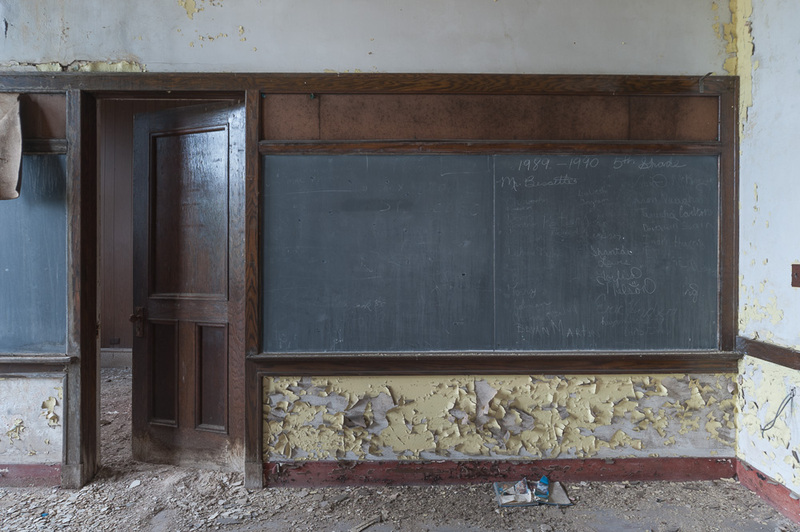 The missing VPS panel was the way into Detroit Open Elementary School…..at one time. The exterior of Detroit Open Elementary School. The demolition of the Luben in 2010. A view inside of Tiger Stadium during the demolition. The United Artists Theater in 2006. A look inside the Luben. A view of the exterior of the Senate Theater. A view of the Farwell Building and Capitol Park. A view of the back exterior and the ghost sign from the building’s last days as the Meyer Jewelry Co. Building. The exterior of Harvard Square Centre. The exterior of the National Theatre. The exterior of the former Meyer Jewelry Company Building. A look down Woodward Avenue from the from the front of the former Meyer Jewelry Co. The exterior of the former Wright-Kay Jewelry Company Building. The exterior of the Detroit Fire Department Engine 8 fire station. A Detroit city boundary map still hangs near the stairwell inside of the former Detroit Fire Department Engine 8. A look inside the garage of the former Detroit Fire Department Engine 8. The garage of the former Detroit Fire Department Engine 8. 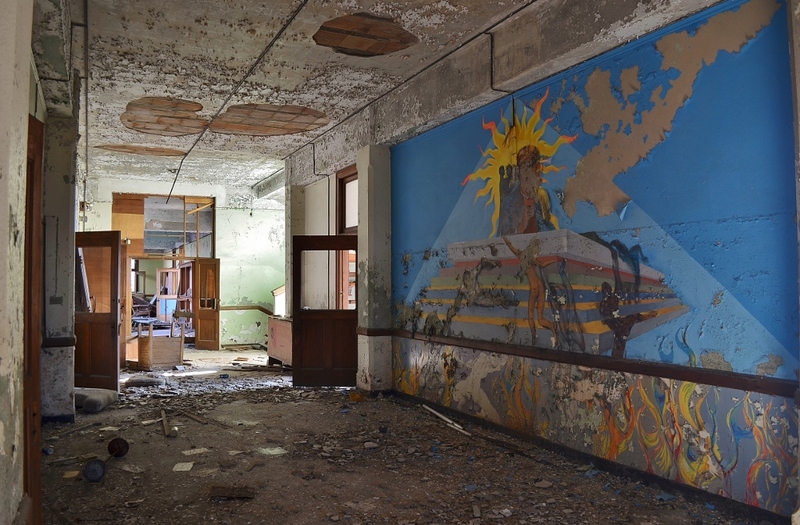 A fire fighting mural was painted in the recreation area at the former Detroit Fire Department Engine 8. The exterior of the former Wright-Kay Jewelry Co. Building. The exterior of the Broderick Tower during the 2012 renovation. Pictures of fires still hang on the walls in the recreation area inside the former Detroit Fire Department Engine 8 station. A look at back at the boarded-up Woodward Avenue entrance at the Whitney Building. The recreation area inside of the former Detroit Fire Department Engine 8 station. A log book to keep track of all the fire runs for the former Engine 8. A 2012 view of the two “Davids,” as in the David Whitney and the David Broderick Tower. A view of some of the books and paperwork left behind in the office at the former Detroit Fire Department Engine 8 station. A look at the pool table in the recreation area at the former Detroit Fire Department Engine 8 station. A close up of the mural of firefighters in action that adorned the recreation area wall at the former Detroit Fire Department Engine 8 station. A view of the Film Exchange Building from Cass Avenue. A view of the demolition of Midland Elementary School. A look at the 2012 renovations of the GAR Building. A view of the GAR Building during the renovations in 2012. An exterior view of the former Seventh Precinct Detroit Police Station. The exterior of the former Detroit Fire Department Engine 10 station. A look at Herman Kiefer Hospital in 2012. A look at the recreation room in the former Detroit Fire Department Engine 10 station. A world map still hangs on the wall in the recreation room at the former Detroit Fire Department Engine 10 station. A look at the pool table in the recreation room at the former Detroit Fire Department Engine 10 station. The tile-work in the entrance that was made to represent Engine 10. 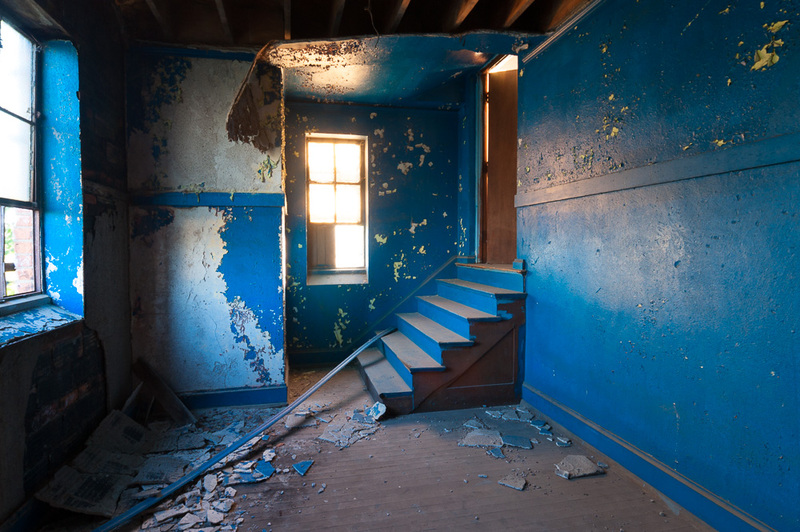 A look at the stairway inside the former Detroit Fire Department Engine 10 station. A look at the original iron hand-railed stairwell and the original wooden doors inside the former Detroit Fire Department Engine 10 station. A look inside the garage at the former Detroit Fire Department Engine 10 station. The arched, tiled doorway leading from the office into the garage at the former Detroit Fire Department Engine 10 station. A “DANGER” sign that was announcing the closing of Engine 10 sits in the middle of the garage floor. A look at the “DANGER” sign from when Engine 10 closed. The sign was laying on the ground in the middle of the garage for some odd reason. The garage at the former Detroit Fire Department Engine 10 station. The swimming pool at Cooley High School. A look at the gymnasium in Cooley High School. A look at the gymnasium floor from the track above the gymnasium. A view of the Cooley High School gymnasium from the track above. The gymnasium and track above the gymnasium at Cooley High School. The hallway lockers at Coolidge Elementary School. The wooden bookshelves of the library at Coolidge Elementary School. The auditorium at Coolidge Elementary School. A few smiley faces were painted above the lockers at Coolidge Elementary School. A view of the “OFFICE” entrance in the main hallway at Coolidge Elementary School. The library fireplace at Coolidge Elementary School. A view of a fireplace in one of the classrooms at Coolidge Elementary School. The drafting board in the art classroom at Coolidge Elementary School. A view of the hallway and lockers at Coolidge Elementary School. A row of lockers is in the midst of being scrapped at Coolidge Elementary School. Some textbooks fill the cabinetry in a classroom at Coolidge Elementary School. The Detroit “D” adored the gymnasium wall at Coolidge Elementary School. Paintings of the different sporting balls was on the wall in the Coolidge Elementary School gym. Some of the gymnasium lockers have been scrapped. A basketball hoop still hangs in the gym at Coolidge Elementary School. A look at the Coolidge Elementary School gymnasium. The exterior of Coolidge Elementary School. The stairway and hallway at Coolidge Elementary School. The gymnasium at Coffey Elementary School. A look down the hallway and classrooms at Coffey Elementary School. The home-economics classroom at Coffey Elementary School. A look at the drawers in the art classroom at Coffey Elementary School. A television monitor hangs in the art classroom at Coffey Elementary School. A look at the television monitor that was still hanging in the art classroom at Coffey Elementary School. The “BOY’S LAVATORY” at Coffey Elementary School. A look inside a classroom at Coffey Elementary School. The “MAIN OFFICE” at Coffey Elementary School. A look inside the library at Coffey Elementary School. A television monitor still hangs in the library at Coffey Elementary School. A view of the basement auditorium at Our Lady Gate of Heaven Catholic Church. The auditorium at Coffey Elementary School. A view of the auditorium seating at Coffey Elementary School. A view of inside the turret at Our Lady Gate of Heaven Catholic Church. A view of the auditorium seating from the stage at Coffey Elementary School. A stained-glass window in the stairway of the Our Lady Gate of Heaven Catholic Church parish house. A look at the arched entrances in the Our Lady Gate of Heaven Catholic Church parish house. A view of the main stairwell at Our Lady Gate of Heaven Catholic Church. A Disney “BATH TIME” mural in the daycare at Our Lady Gate of Heaven Catholic Church. A mural of children playing in the classroom at Our Lady Gate of Heaven Catholic Church. The auditorium at Our Lady Gate of Heaven Catholic Church. A view of the sanctuary from the upper balcony at Our Lady Gate of Heaven Catholic Church. A close up view of one of the chandeliers at Our Lady Gate of Heaven Catholic Church. A line of chandeliers in the sanctuary at Our Lady Gate of Heaven Catholic Church. A look at the chandeliers that were still hanging from the ceiling in the sanctuary. A view of the stained-glass windows and details of the upper balcony at Our Lady Gate of Heaven Catholic Church. A close up view of the upper balcony stained-glass windows and chandeliers at Our Lady Gate of Heaven Catholic Church. A look at the intricate, brass door handles at Our Lady Gate of Heaven Catholic Church. The confessional booth at Our Lady Gate of Heaven Catholic Church. A look at the stained-glass windows and the pews inside the sanctuary at Our Lady Gate of Heaven Catholic Church. A view of the upper balcony at Our Lady Gate of Heaven Catholic Church. A look at the stained-glass windows in the corner seating of Our Lady Gate of Heaven Catholic Church. A stone structure on the alter at Our Lady Gate of Heaven Catholic Church. Chandeliers still hang in the side area of the pulpit at Our Lady Gate of Heaven Catholic Church. A look at the seating area to the side of the pulpit at Our Lady Gate of Heaven Catholic Church. A look at the stained-glass that was above the pulpit side seating area. The exterior of Cooley High School. A view of the sanctuary from the pulpit at Our Lady Gate of Heaven Catholic Church. The sanctuary from the pulpit at Our Lady Gate of Heaven Catholic Church. A mosaic-tile shrine next the alter at Our Lady Gate of Heaven Catholic Church. The beautiful, mosaic-tile shrine at Our Lady Gate of Heaven Catholic Church. A view of the sanctuary from the alter at Our Lady Gate of Heaven Catholic Church. A look at the alter at Our Lady Gate of Heaven Catholic Church. A view of the upper balcony in the sanctuary of Our Lady Gate of Heaven Catholic Church. A look at one of the confessional booths at Our Lady Gate of Heaven Catholic Church. A view of the sanctuary stained-glass windows and the upper balcony at Our Lady Gate of Heaven Catholic Church. A view of the pews in the sanctuary at Our Lady Gate of Heaven Catholic Church. The different types of stained-glass windows at Our Lady Gate of Heaven Catholic Church. The confessional booths at Our Lady Gate of Heaven Catholic Church. The exterior entrance at Coffey Elementary School. The exterior of Coffey Elementary School. A view of the lights and pews inside Our Lady Gate of Heaven Catholic Church. The pews inside the sanctuary at Our Lady Gate of Heaven Catholic Church. The sanctuary at Our Lady Gate of Heaven Catholic Church. The main lobby and entrance into the sanctuary at Our Lady Gate of Heaven Catholic Church. The exterior of Our Lady Gate of Heaven Catholic Church. A close up of the mosaic-tiled shrine near the alter at Our Lady Gate of Heaven Catholic Church. A side view of the sanctuary. A view of the sanctuary from the pulpit and alter at Our Lady Gate of Heaven Catholic Church. The pulpit and alter at Our Lady Gate of Heaven Catholic Church. A look at the upper balcony and the chandeliers at Our Lady Gate of Heaven Catholic Church. The side pews that were tucked into a corner in the sanctuary at Our Lady Gate of Heaven Catholic Church. The corner pews at Our Lady Gate of Heaven Catholic Church. The back of the sanctuary. A look at the sanctuary from the middle of the pews at Our Lady Gate of Heaven Catholic Church. A view of the sanctuary from the back of the church. A view of the sanctuary from the back corner of the church. A view of one of the confessional booths at Our Lady Gate of Heaven Catholic Church. The sanctuary from the corner of the church. The stained-glass window I one of the offices at Our Lady Gate of Heaven Catholic Church. The main entrance into the sanctuary at Our Lady Gate of Heaven Catholic Church. The main lobby at Our Lady Gate of Heaven Catholic Church. The main entrance exterior of Our Lady Gate of Heaven Catholic Church. One of the exterior side entrances at Our Lady Gate of Heaven Catholic Church. The main entrance and lobby at Our Lady Gate of Heaven Catholic Church. The columned-entrance into the office at Our Lady Gate of Heaven Catholic Church. The auditorium at Courville Elementary School. The small gymnasium at Courville Elementary School. A view of the basketball hoop in the gymnasium at Courville Elementary School. Alphabet letters still hang in the library at Courville Elementary School. The main hallway at Courville Elementary School. The “COURVILLE” banner has fallen to the ground. At one time, this window was the way into Courville Elementary School. A view of the auditorium at Coolidge Elementary School. A view of the auditorium seating inside Coolidge Elementary School. A brick fireplace in one of the classrooms at Coolidge Elementary School. The gymnasium at Coolidge Elementary School. Murals in the hallway of Cooley High School. The swimming pool at Crockett Technical High School. One of the gymnasiums at Crockett Technical High School. One of the gyms inside Crockett Technical High School. The basketball court in the gymnasium at Crockett Technical High School. The gymnasium at Cooley High School. The Industrial Arts classroom at Cooley High School. An open window at Cooley High School. A close up view of one of the entrances at Cooley High School. A close up of the stone-detailed entrance at Coolidge Elementary School. A view of the jungle cartoon mural in the hallway at Cooley High School. A view of the murals in the Media Center at Cooley High School. Murals of wildlife and nature were painted above the bookshelves in the Media Center at Cooley High School. A view of the auditorium from upper balcony at Courville Elementary School. A mural of wildlife, science, and nature adorns the Media Center wall. A view of the auditorium from the upper balcony at Courville Elementary School. The original, beautiful woodwork in the library at Cooley High School. The interior of the media center at Cooley High School. The auditorium seating from the stage at Courville Elementary School. A look at the jungle mural above the “MEDIA CENTER” entrance in the hallway at Cooley High School. The climbing ropes still hang in the large gymnasium at Courville Elementary School. A jungle-scenery painting above the entrance to the “MEDIA CENTER” at Cooley High School. A cartoon of a painting of some jungle scenery in the hallway at Cooley High School. A mural of different cultures was in between some lockers at Cooley High School. The Pewabic Pottery mosaic-tiled backsplash in the stairwell of the hallway at Courville Elementary School. A close up of Thomas Cooley mural that was painted above the bookshelves in the library. A close up view of the gorgeous, woodwork and upper balcony in the library at Cooley High School. A look at the bookshelves in the library at Cooley High School. The mural of Thomas Cooley was painted in the library at Cooley High School. The interior of library at Cooley High School. At one time, this bent metal VPS was the way into Courville Elementary School. A look at a basketball hoop with a Cooley Cardinal painted on it in the gym. A mural of a stone bridge and nature was painted on the wall at Cooley High School. A mural of famous African-American men adorns the wall above the display cases in the hallway at Cooley High School. The gymnasium at Cooley High School. The power was still on at this point. At one time in the past, this was the way into Cooley High School. At one time, this broken window was the way into Cooley High School. The front exterior of Crockett Technical High School. A view of the auditorium seating from the stage. The auditorium from the upper balcony at Crockett Technical High School. The clock still hangs on the wall above the fireplace in the library at Crockett Technical High School. The library at Crockett Technical High School. The science lab at Crockett Technical High School. The auditorium at Cooley High School, back when there was still power. A look at one of the gymnasiums at Crockett Technical High School. Crockett Technical High School had two gymnasiums to separate the boys and the girls. The way into Crockett Technical High School…..at one time anyway. The gymnasium at Crockett Technical High School. The auditorium at Crockett Technical High School. The exterior of Crockett Technical High School. The auditorium at Carstens Elementary School. The children’s playground in the back of Carstens Elementary School. A look down the hallway of student lockers at Carstens Elementary School. A look inside the science room at Carstens Elementary School. A look at the “WELCOME TO CARSTENS” mural that was painted in the main entrance at Carstens Elementary School. The mural showed portraits of famous Detroit Public Schools students, among other random people. The light shines perfectly on the hand-painted mural at Carstens Elementary School. A look at the hand-painted portraits of former and famous Detroit Public Schools students. The mural was on display in the main entrance at Carstens Elementary School. A look at the mini-lockers in one of the classrooms at Carstens Elementary School. A mural of children playing in the grass is on display on the wall leading to the auditorium at Carstens Elementary School. A look down one of the hallways of student lockers at Carstens Elementary School. The exterior of Cadillac Middle School. The sign and main entrance exterior at Cadillac Middle School. The main entrance into Carstens Elementary School. A look inside a wallpapered classroom at Burton Elementary School. The library at Burton Elementary School. A clock still hangs in the hallway at Burton Elementary School. Note the power was still on back then. A look at a television that still hangs above the chalkboard inside a classroom at Burton Elementary School. Some of the books were still left on the bookshelves, but most had been thrown to the ground in the library at Chandler Elementary School. The library at Chandler had gotten trashed and ransacked by 2012. The auditorium was also trashed inside of Chandler Elementary School. The mural-covered hallway at Chandler Elementary School. Note that the locker doors have been scrapped. A look at “THE CHANDLER RANBOW OF PRIDE” that adorned the wall above the space where lockers and a drinking fountain used to be. A look at the basketball hoop inside the gymnasium at Burton Elementary School. The gymnasium at Burton Elementary School. A look at the center of the gymnasium at Burton Elementary School. A look at the basketball hoop that still hangs in the gym at Burton Elementary School. A look at the anatomy dummy that was still hanging out in the science classroom at Chandler Elementary School. A look at the school supplies that still were on the shelves in the cabinetry at Chandler Elementary School. A look at the cafeteria inside of Burton Elementary School. The cafeteria also featured a basketball hoop…..for some reason, at some point it seemed that Burton Elementary School had two gymnasiums. The auditorium at Burton Elementary School. A look at the fireplace and the colored-diamond pattern on the floor in one of the classrooms at Burton Elementary School. This classroom at Burton Elementary School also featured patterns of multi-colored diamonds and circles. The window to the right (with board underneath and on the ground) was our way into Burton Elementary School back then. The exterior main entrances at Burton Elementary School. A look at the façade detail at one of the main entrances into Burton Elementary School. The exterior of Burton Elementary School. A look at the trashed main hallway at Chandler Elementary School. Note the lockers have all been removed and scrapped. A look inside one of the classrooms at Chandler Elementary School. The pictured alphabet cards still hang in the classroom. A close up view of textbooks that were still in the storage room at Chandler Elementary School. A look at the door-less lockers inside the main hallway at Chandler Elementary School. A green chair, without it’s legs, sits in the basement hallway at Chandler Elementary School. The gymnasium at Chandler Elementary School still showed the signs of fire damage, as the floor is still buckling. The blue and yellow Chandler “C” at the center court of the gymnasium. A look at the gymnasium at Chandler Elementary School. The gym was in terrible shape by 2012. A look at the children’s books that were still on the shelves of this little bookcase in a classroom at Chandler Elementary School. The lights were on, as a clock still hangs in the hallway at Burton Elementary School. The stone and Pewabic-tiled fireplace in a classroom at Burton Elementary School. The student lockers and a drinking fountain in the main hallway at Burton Elementary School. Note the power was still on back then. A look inside the auditorium at Burton Elementary School. A look inside the library at Campbell Elementary School. The auditorium at Campbell Elementary School. A mural of people’s faces adorns the wall in the hallway at Campbell Elementary School. A mosaic-tiled mural of an early explorer that is sailing in a boat, adorns the wall in the main lobby at Campbell Elementary School. The power was still on during our first visit to Campbell. A look down the main hallway at Brady Elementary School. A look at the auditorium seating from the stage inside Brady Elementary School. Ceiling tiles have fallen tot he ground in the gymnasium at Brady Elementary School. A look at the basketball hoop inside the gymnasium at Brady Elementary School. A look at the gymnasium inside of Brady Elementary School. The library at Brady Elementary School featured a Pewabic Pottery tiled-fireplace with brick and tile columns, as well as gorgeous wooden details. A look at the stairway and main hallway at Brady Elementary School. Brady Elementary School featured a gymnasium and cafeteria combination. A beautiful, brick fireplace in one of the classrooms at Brady Elementary School. This was the way into Brady Elementary School at one time. A look at the Pewabic glazed-tiles that were featured above the doorway at Brady Elementary School. A closer look at the exterior of Brady Elementary School. The façade detail at Burbank Middle School. The exterior of Burbank Middle School. An old oil painting has fallen to the ground in the patient hallway at the Arnold Home. A look at the nurses station at the Arnold Home. Note the once, gorgeous Pewabic tiled-fountain on the left side of the hallway. A leather chair sits in the hallway at the Arnold Home. The windows that used to lie this corridor have been scrapped. A close up view of the brass railings at the former American Motors Corp. Headquarters. An arm chair sits in front of the window inside one of the former residential rooms at the Arnold Home. The television and security desk in the lobby at American Motors Corp. Headquarters. A look at the marble stairway and columns inside the lobby at American Motors Corp. Headquarters. The chandelier still hags in the main lobby at American Motors Corp. Headquarters. The chandelier hangs over the metal detectors and vestibule entrance at American Motors Corp. Headquarters. A look at an old “incident report” write up that happened when a patient/resident would hurt themselves, fall ill, or pass away. The lobby at American Motors Corp. Headquarters featured a gorgeous, marble staircase and columns, as well as intricate, iron railings. The main lobby at the Arnold Home. The ceiling is deteriorating badly and the couch has seen better days. A side profile of the beautiful, marble staircase and the iron hand-rails that lined the stairs. Note the intricate, brass grilles for the vents and the “NO CAMERAS PERMITTED” sign. The recreation room/ballroom at the Arnold Home. It featured mirrored-walls and prop designs. A look at the main entrance vestibule from the marble staircase. The piano inside the former recreation room/ballroom at the Arnold Home had been smashed and had fallen apart. Note the beautiful, modern, concrete-block wall in the background. A look at the Arnold Home piano that was on it’s last leg….literally. A look at the former recreation room/ballroom inside the Arnold Home. The room featured a piano, a dance floor, and tables for games. A chandelier still hangs from a barreled-ceiling at the top of the staircase in the American Motors Corp. Headquarters. Note the marble bordered doorway. A look through the marble-bordered doorway on the second floor at American Motors Corp. Headquarters. The marble-bordered doorway and barreled-ceiling of the second floor lobby inside of American Motors Corp. Headquarters. A close up view of the brass chandelier and the marbled-bordered doorway in the second floor lobby area. A look at the gorgeous details of the second floor lobby area at American Motors Corp. Headquarters. The chandelier and detailed, crown-molding in one of the former offices inside American Motors Corp. Headquarters. A look at a hidden door in the conference room at American Motors Corp. Headquarters. A look at the beautiful, crown molding and chandelier that were in on of the offices at American Motors Corp. Headquarters. The exterior of the Ancient Free Masons Lodge. A view of the auditorium and meeting hall at the Ancient Free Mason Lodge. Tables were still in the meeting hall that was located inside the auditorium at the Ancient Free Mason Lodge. A look at the beautiful, detailed vent grilles and some of the intricate, stage bordering at the Ancient Free Mason Lodge. A look at the security desk and main lobby. The auditorium from the balcony at the Ancient Free Mason Lodge. A look at the magnificent details of the main lobby. Included are the marble columns and staircase, the intricate iron hand-rails, and the brass chandelier. Some of the chandeliers still hang in the auditorium and stage inside the Ancient Free Mason Lodge. A close up view of the brass chandelier, the iron hand-rails, and the marble stairs inside the main lobby. A look from inside the main entrance vestibules in the main lobby of the AMC Headquarters. A look at the vestibules and push-doors that were used as an entrance and exit to the main lobby at the AMC Headquarters. Lights still hang in the former fitness/exercise room at the American Motors Corporation Headquarters. Televisions still hang in the former fitness room at the American Motors Corp. Headquarters. A look at the work out equipment that was still in the exercise/fitness room at the American Motors Corp. Headquarters. The scoreboard still hangs at center court in the gymnasium at Burbank Middle School. The newer auditorium at Burbank Middle School. The swimming pool at the former Andrew Jackson intermediate School. A look at the swimming pool at the former Andrew Jackson intermediate School. The auditorium at the former Andrew Jackson intermediate School. A view of the auditorium seating from the stage at the former Andrew Jackson intermediate School. Note the clock still hanging on the balcony wall. A view of the stage inside the auditorium at the former Andrew Jackson intermediate School. A mural of students is painted on the wall in the hallway at the former Andrew Jackson intermediate School. A mural of “EXPLORE THE WORLD” adorns the wall next to the student lockers. A look at center court of the gym at the former Andrew Jackson intermediate School. The basketball hoops were still hanging in the gymnasium at the former Andrew Jackson intermediate School. A look inside the gymnasium of the former Andrew Jackson intermediate School. A look at the arched-windows and plaster details of the library at the former Andrew Jackson intermediate School. The library at the former Andrew Jackson intermediate School featured a mirrored-ceiling and extraordinary crown molding and plaster detail. A classroom at the former Andrew Jackson intermediate School that featured natural skylights. Unfortunately, they were covered up at some point. A look down the main hallway of lockers at the former Andrew Jackson intermediate School. A look at the auditorium stage inside of Burt Elementary School. A view of the auditorium from the upper balcony at Burt Elementary School. A lunch table lays broken in the gymnasium/cafeteria at Burt Elementary School. A look at the school’s logo at center court inside the gym at Burt Elementary School. The basketball hoops and climbing ropes still hang in the gymnasium at Burt Elementary School. The door was ajar and that is how we used to get into Burt Elementary School. The exterior details at Burt Elementary School. The exterior of Burt Elementary School. The exterior of Apostolic Faith Church of Love. The cafeteria inside of the former Andrew Jackson intermediate School. A look at the mirrored-ceiling and arched windows in the library at the former Andrew Jackson intermediate School. A look at the sanctuary inside of the Apostolic Faith Church of Love. A look at the pulpit and alter inside of the Apostolic Faith Church of Love. The lights still hang from the beautiful detailed ceiling inside the library of at former Andrew Jackson intermediate School. A view of the library inside the former Andrew Jackson intermediate School. The auditorium at the former Andrew Jackson intermediate School also featured gorgeous arches and plaster detail. A mural of students was painted on the main entrance wall at the former Andrew Jackson intermediate School, last used as Finney High School. The exterior of the former Andrew Jackson intermediate School. A look at the façade details of the former Andrew Jackson intermediate School. A look at the exterior of the former Andrew Jackson intermediate School. The swimming pool still had some stagnant, chlorinated-water left in it from the school’s last days. Note the radiators are lined up and ready to be scrapped away. “HOMEWORK” on the chalkboard inside one of the classrooms at the former Andrew Jackson intermediate School. The power was still on inside the former Andrew Jackson intermediate School. The “PREPARE” mural of studying students was on full display with the hallway lighting. A look at the “PREPARE” and “EXPORE THE WORLD” mural that was painted on the wall next to the student lockers. The basketball hoop’s rim was dunked on too many times. The large gymnasium at the former Andrew Jackson intermediate School. The light were still on inside the school back then. The gymnasium was all lit up for this shot. The lights were on and helped to illuminate the gymnasium at the former Andrew Jackson intermediate School. The cafeteria at the former Andrew Jackson intermediate School. A clock still hangs in the main hallway at the former Andrew Jackson intermediate School. Note the power was still on back then. The pool at the former Andrew Jackson intermediate School. Note the radiators are ready to be hauled away for scrap. A mural of some children playing around a tree was on one of the walls inside a former classroom at Best Academy. The “BEST ACADEMY BULLDOGS” used a section of the former Detroit Osteopathic Hospital as a school, but it was short lived and quickly abandoned as well. The secretary and reception desk at Best Academy, formerly Detroit Osteopathic Hospital. A superman mural was on display on the main hallway wall at Best Academy. A look at a mural of famous faces that was painted on the main hallway wall at Best Academy. A look at the famous faces painting that adorned the wall inside the main hallway at Best Academy, which used to be Detroit Osteopathic Hospital. Former cubicles in the office section at the former American Motors Corp. Headquarters. The marble-detailed, doorway border and barreled-ceiling of the second floor lobby area at the former American Motors Corp. Headquarters. The administration office inside of Biddle Elementary School. The second floor vestibule at the top of the marble staircase inside of the former AMC Headquarters. A look down the hallway of lockers at Biddle Elementary School. A look inside one of the classrooms at Biddle Elementary School. A look at one of the classrooms at Biddle. Basketball hoops still hang in the gymnasium at Biddle Elementary School. A brass chandelier still hangs in the stairwell at the former American Motors Corp. Headquarters. A look at the cafeteria and gymnasium combination room at Biddle Elementary School. A look at the auditorium/gymnasium/cafeteria at Biddle Elementary School. The brass chandelier still hangs from the barreled-ceiling in the main stairwell. A view of the marble staircase and iron hand-rails at the former American Motors Corp. Headquarters. Note the beautiful, vent grilles had been scrapped by 2012. A look at the bras chandelier in the main entrance to the former American Motors Corp. Headquarters. A view of the vestibule entrance and main staircase at the former American Motors Corp. Headquarters. A look at the iron hand-rails that lined the marble staircase at the former American Motors Corp. Headquarters. The security desk and monitor still sit in the main lobby at the former American Motors Corp. Headquarters. A television monitor still hangs in the main lobby at the former American Motors Corp. Headquarters. A look at the marble details of the staircase and columns in the main lobby. Exercise equipment was still in the fitness center at the former American Motors Corp. Headquarters. A look at the treadmills inside the fitness center at the former American Motors Corp. Headquarters. A look at all of the equipment that was left behind in the fitness center/exercise room at the former American Motors Corp. Headquarters. A close up view of the weight machines in the fitness center area at the former American Motors Corp. Headquarters. Leg-press machines were also left behind in the fitness area at the former American Motors Corp. Headquarters. A look inside one of the offices at the former American Motors Corp. Headquarters. This used to be the way that we had to get into the former American Motors Corp. Headquarters. It was NOT as easy as it looks! One of the wood-paneled, executive offices at the former American Motors Corp. Headquarters. The wood-paneled walls inside one of the former executive offices at the former American Motors Corp. Headquarters. A chandelier still hang from the beautiful detailed ceiling in one of the former office. The lobby of the Broderick Tower during the renovations. The magnificent details of the Broderick Tower lobby. A semi-circular, sun-dial in the details of the lobby at the Broderick Tower. The lobby of the Broderick Tower during the renovations in 2012. The arched, barreled-ceiling in the hallway at the Broderick Tower. The elevator lobby at the Broderick Tower. A look at the granite walls, the barreled-ceiling, and the brass elevator inside the Broderick Tower. The mailboxes in the lobby of the Broderick Tower. A chandelier hangs from the barreled-ceiling in the main corridor at the Broderick Tower. Red, leather couches were added to the lobby of the Broderick Tower in 2012, shortly before re-opening it’s doors to the public. A look at the main entrance in the lobby of the Broderick Tower. The auditorium inside of Burt Elementary School. A look at some rather interesting drawers in one of the classrooms at Burt elementary School. The gymnasium/cafeteria at Burt Elementary School. Paintings above the bookshelves in the library at Burt Elementary School. Hand-paintings of animals and a kid riding a bike adorn the walls of the library at Burt Elementary School. A painting of zebras in the safari adorns the wall above the student lockers at Burt Elementary School. A look inside the tower of the former American Motors Corp. Headquarters. Climbing this ladder in the tower portion of the former American Motors Corp. Headquarters was not fun! A look at the old gymnasium in Burbank Middle School that had been converted into a “Industrial Technology” or a “shop” classroom. A look at the small windows in the tallest portion of the tower at the former American Motors Corp. Headquarters. The beautiful, woodwork in the library at Bethune Elementary School. A blue, range, and yellow mural was painted on the chalkboard in one of the classrooms at Bethune Elementary School. A fireplace in one of the classrooms at Bethune Elementary School. A look down one of the main hallways at Bethune Elementary School. A look out of the tower window at the former American Motors Corp. Headquarters. A look at the skylights in the gymnasium at Bethune Elementary School. A basketball still sits on the floor in the gymnasium at Bethune Elementary School. A look at the natural skylight in the gymnasium at Bethune Elementary School. The auditorium at Bethune Elementary School. Note the power was still on back then. The cafeteria at Bethune Elementary School. A look at the original, wooden cabinetry inside a classroom at Bethune Elementary School. The exterior of the former American Motors Corporation Headquarters. Note the last window on the right is ajar. This is how we first entered Bethune Elementary School. A look at the façade detail at the former AMC Headquarters. The side exterior of Bethune Elementary School. The façade detail at the American Motors Corporation Headquarters. The school sign and exterior of Bethune Elementary School. The exterior of the former American Motors Corp. Headquarters. The main entrance exterior at Bethune Elementary School. The exterior at Bethune Elementary School. The exterior of the AMC Headquarters. A look at the ceiling tiles that have fallen to the ground in the former art classroom at Burbank Middle School. A clock still hangs in the main hallway at Burbank Middle School. A Burbank “B” adorns the stage curtain in the auditorium at Burbank Middle School. A view of the auditorium from the upper balcony at Burbank Middle School. A look inside the former “shop” or “Industrial Tech” classroom at Burbank Middle School. This was the original gymansium for Burbank Middle School. The auditorium stage at Brewster-Wheeler Recreation Center in 2012. The graffiti-covered basketball hoops still hang in the gymnasium at the Brewster-Wheeler Rec Center in 2012. A look at the beautiful, Pewabic Pottery tiles in the swimming pool area at the Brewster-Wheeler Rec Center. You can see by 2011, the scrappers started chiseling away at them to try and remove them. A 2012 view of the pool fromt eh upper balcony, where the bench seating used to be. You can see the little “stubs” that were left from the scrappers removing the metal railings and metal benches. Terrible graffiti “tags” surround the basketball hoop in the gymnasium at the Brewster-Wheeler Rec Center in 2012. A look at the gymnasium that Detroit’s own Chris Webber had donated just a few years prior to closing. The basketball hoops in the gymnasium at the Brewster-Wheeler Rec Center. The Brewster-Wheeler Rec Center had gotten so disgraced by supposed “graffiti artists” that thought it was a genius idea to spray paint a historic landmark. The center court of the gymnasium had Chris Webber’s “C-WEBB” signature and his logo in 2012. A look at the semi-circular room in one of the classrooms at Brady Elementary School. The library at Bethune Elementary School. The “THIS COURT WAS DONATED BY DETROIT’S OWN CHRIS WEBBER” sign on the wall has been completely ruined and covered by ugly graffiti by 2012. A look down the natural skylights on the second floor hallway of Brady Elementary School. Chairs and tables were still in the cafeteria at Bethune Elementary School. The auditorium at Brady Elementary School. A look down the main hallway at Bethune Elementary School. Note the drinking fountains have been scrapped. A look at the auditorium at Brady Elementary School. The gymnasium at Bethune Elementary School featured skylights that would allow the sunlight to naturally light up the gym. The ceiling tiles in the gymnasium at Brady Elementary School have fallen to the ground. The gymnasium at Bethune Elementary School. A fire at an abandoned Detroit church. The swimming pool at the YMCA Western Branch. “NO RUNNING” at the YMCA Western Branch. The locker room of the YMCA Western Branch. The weight room of the YMCA Western Branch. A look at the weight room inside the YMCA Western Branch. The YMCA “Y” at center court. Target practice in the gymnasium of the YMCA Western Branch. A basketball hoop hangs in the gymnasium of the YMCA Western Branch. A look at the gymnasium inside the YMCA Western Branch. The basketball hoops inside the gym at the YMCA Western Branch. The gymnasium at the YMCA Western Branch. The handball court inside the YMCA Western Branch. A mural of a kid going fishing was on the wall leading to the gymnasium. A mural of a sunny day on the wall inside the hallway at the YMCA Western Branch. The main conference hallway at the YMCA Western Branch. The dining room at the YMCA Western Branch. The arched ceiling of the porch at the YMCA Western Branch. The skylights had been covered up at sometime. A look at the arched porch inside the YMCA Western Branch. The empty swimming pool at the YMCA Western Branch. A view of downtown Detroit from the rooftop of the Southwest Detroit Hospital. A hospital bed and a television in one of the former hospital rooms at the Southwest Detroit Hospital. A look at the nurses station inside of Southwestern High School. The former patient/nurse chart sill hangs on the wall in one of the nurse’s station inside of Southwest Detroit Hospital. A look at the nurse’s station and hallway of patient rooms inside Southwest Detroit Hospital. 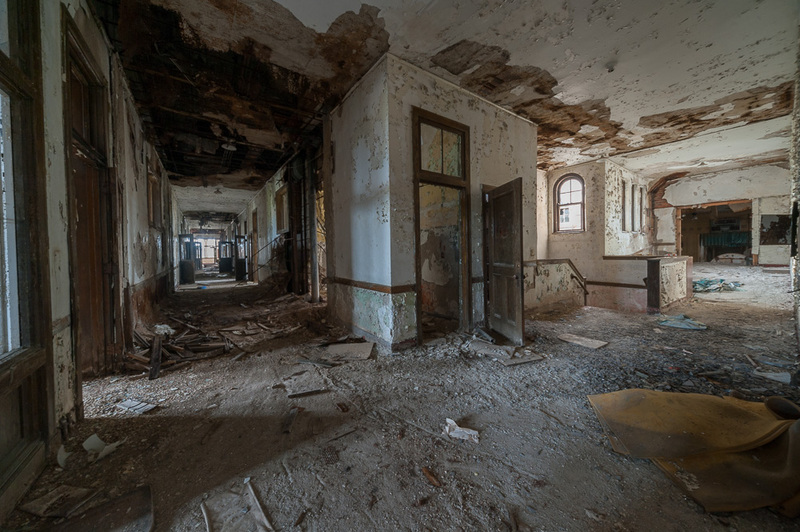 The lobby of Southwest Detroit Hospital had been cleaned out at some point by 2012. The administration offices had been trashed by vandals. 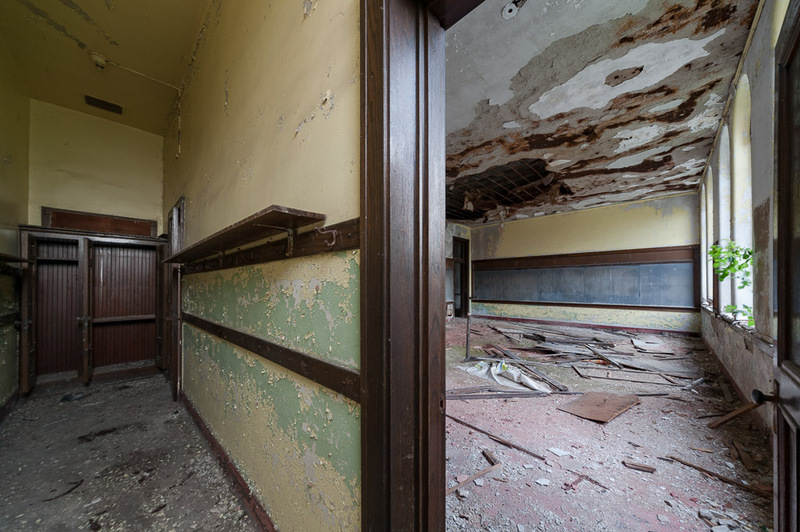 A look inside one of the former ER operating rooms at Southwest Detroit Hospital. Many of the stainless steel fixtures and equipment at Southwest Detroit Hospital had been scrapped and stolen. The “FILM FILE ROOM” had x-rays of former patients still on the shelves at Southwest Detroit Hospital. The x-ray table and equipment was still in some of the operating rooms inside the Southwest Detroit Hospital. The patients files and x-rays that were left behind at the Southwest Detroit Hospital. A look at the former x-ray table inside the Southwest Detroit Hospital. An examination table still sits in one of the exam rooms at the Southwest Detroit Hospital. The courtyard at Southwest Detroit Hospital. A look at the patient waiting room of the “COMMUNITY CARE CENTER” inside the Southwest Detroit Hospital. A look inside one of the patient waiting rooms at Southwest Detroit Hospital. The receptionist desk and hallway leading to the “PATIENT CARE AREA” at the Southwest Detroit Hospital. A look at an original, wooden cabinetry inside one of the offices at the abandoned Detroit church. 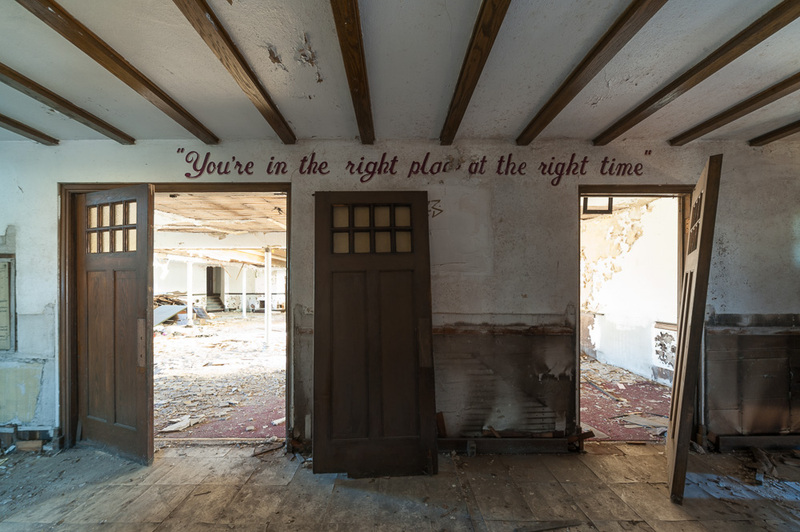 A look at one of the offices at the abandoned Detroit church. The confessional booths in the abandoned Detroit church. The gorgeous ceiling in the main entrance to the abandoned Detroit church. The hand-painted ceiling and iron gates that led into the side office at the abandoned Detroit church. The pews of the balcony at the abandoned Detroit church. A close up of the organ at the abandoned Detroit church. The organ overlooked the sanctuary at the abandoned Detroit church. 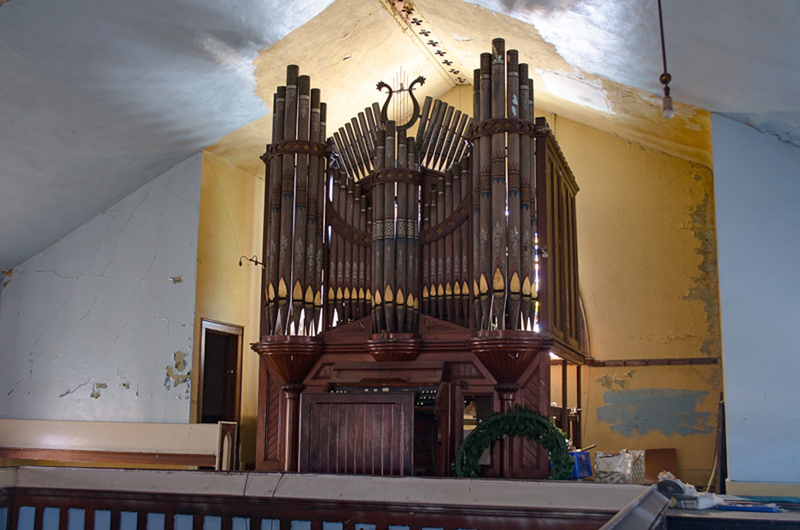 A view of the organ that overlooked the sanctuary inside the abandoned Detroit church. 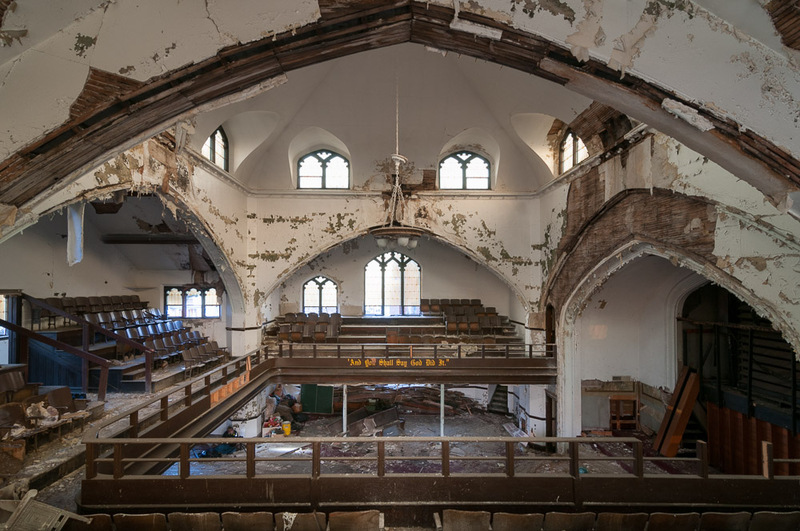 A view of the sanctuary from the upper balcony at the abandoned Detroit church. 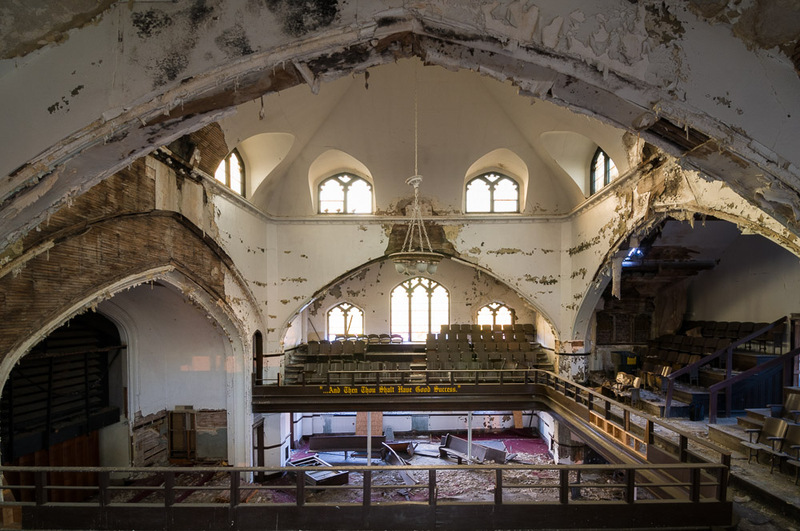 The chandeliers still hang in the sanctuary of the abandoned Detroit church. The organ had started to fall victim to the scrappers. A close up of one of the chandeliers at the abandoned Detroit church. The organ was located on the upper balcony and overlooked the sanctuary. 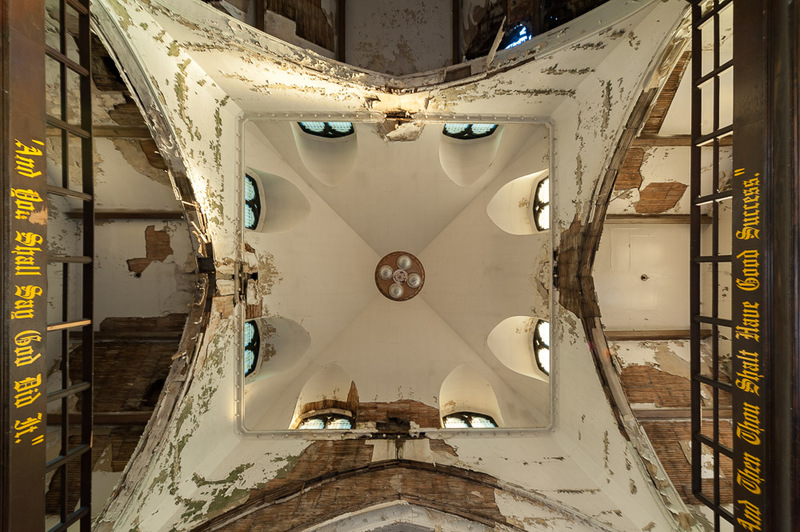 The chandeliers still hang from the ceiling at the abandoned Detroit church. The sanctuary from the upper balcony at the abandoned Detroit church. The organ and the balcony at the abandoned Detroit church. The sanctuary from the upper balcony. 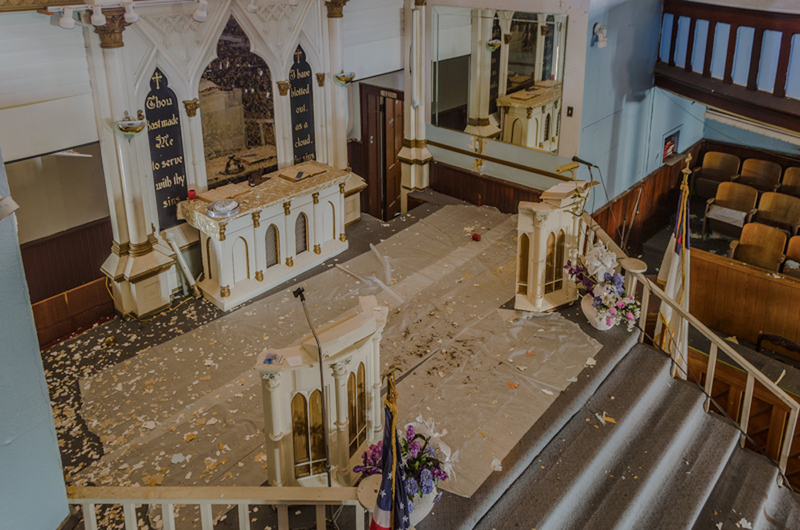 A look at the chandeliers that were still hanging from the sanctuary ceiling. The sanctuary at the abandoned Detroit church. A look at the beautiful ceiling details in the main entrance into the abandoned Detroit church. The view of the church sanctuary. The iron gates in a side room at the abandoned Detroit church. The view of the sanctuary from the pulpit stage at the abandoned Detroit church. A view of the pulpit and the alter at the abandoned Detroit church. A view of the surrounding mosaic walls, iron gates, and granite details of the church’s pulpit and alter. A close up of the granite alter at the abandoned Detroit church. A view of the pulpit and alter at the abandoned Detroit church. The sanctuary, looking toward the main entrance and balcony. 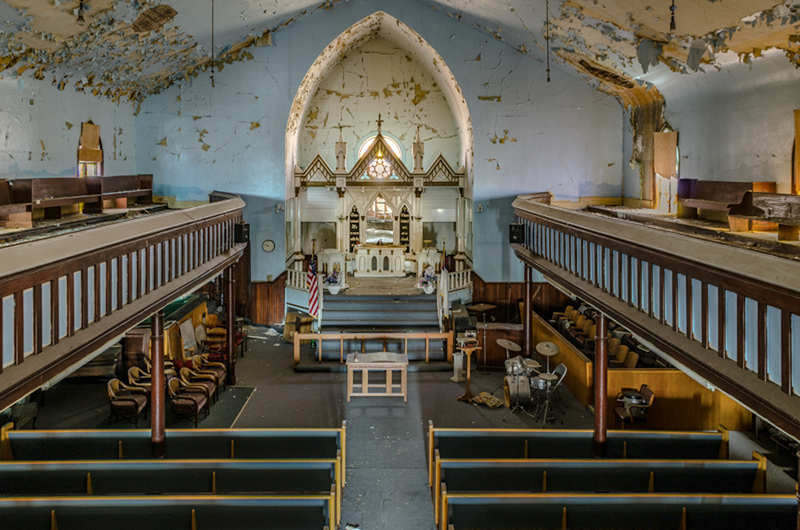 A view of the rows of pews at the abandoned Detroit church. A view of some bookshelves inside one of the former offices in the church’s parish house. A view of the top of the stairwell at the parish house. The kitchen inside the parish house of the abandoned church. The granite shrine of the abandoned Detroit church. 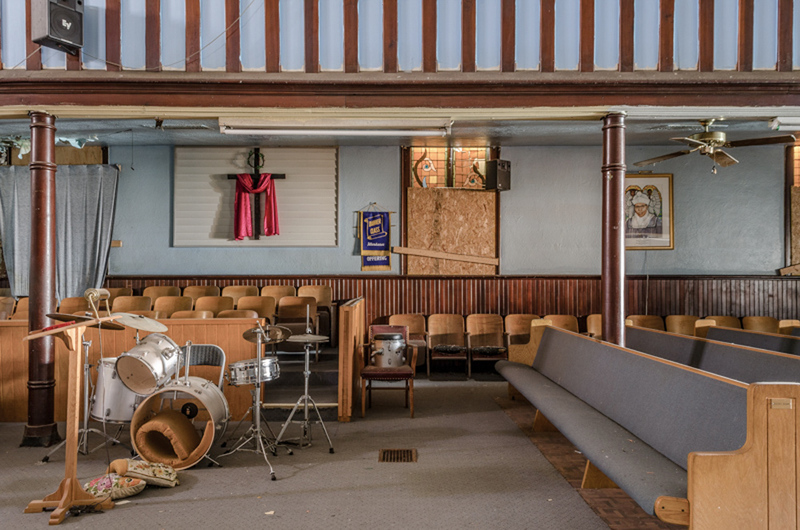 The rows of pews and the confessional booths of the abandoned Detroit church. The granite pulpit and alter at the abandoned Detroit church. The side of the pulpit and sanctuary. A close up of the granite alter. The iron gate detail of the office that was connected to the pulpit. 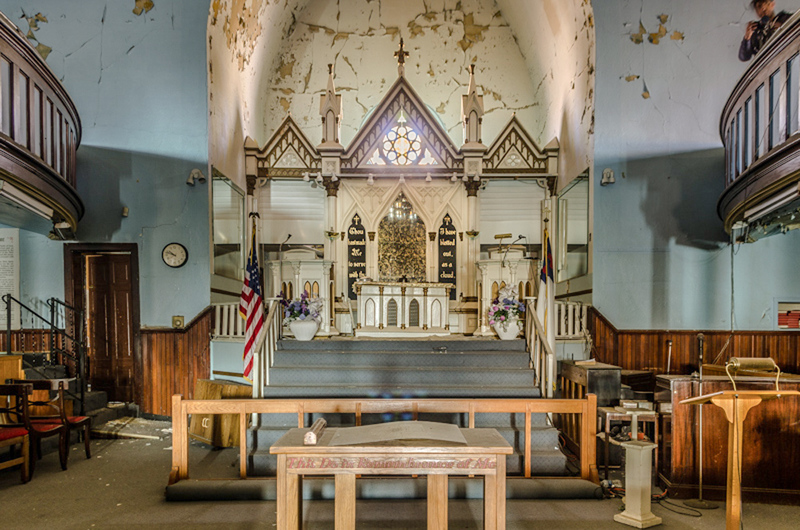 The chandeliers hang over the pulpit at the abandoned Detroit church. A look at the church pews and seating of the abandoned church. A center shot of the pews and the balcony at the abandoned church. A shot of the sanctuary from the back of the church. The main lobby of the abandoned Detroit church. The auditorium ad gymnasium at St. Rita School had been scrapped and had started to fall apart by 2013. A look at the buckled floor in the gymnasium/auditorium of St. Rita School in 2013. The main sanctuary had fallen hard to scrappers and weathering damage. The main entrance lobby area started to show some signs of graffiti “tags” inside of St. Agnes Church. More immature graffiti tags of on the Pewabic Pottery glazed-tiles were still located in the lobby area at St. Agnes Church. It’s sad that these “taggers” have to ruin such beauty. The arched stone details had been stolen ad scrapped from St. Agnes Church. The western window confessional booth at St. Agnes Church. A look back toward the balcony and main entrance from the pulpit at St. Agnes Church. The chairs were stacked in the hallway at Wilkins Elementary School. A mural of Rosa Parks in the hallway above the student lockers at Wilkins. A look at the science laboratory at Purdue Educational Center. Original, wooden drawers in the science laboratory at Purdue Educational Center. Moss grows on the floor inside a classroom at Purdue Educational Center. A look inside the English classroom at Purdue Educational Center. A look down the main hallway at Purdue Educational Center. Books pile up on the floor at Purdue Educational Center. The auditorium at Purdue Educational Center. A view of the upper balcony seating in the auditorium of the former Eastern Junior High School/Purdue Educational Center. The auditorium stage and seating at the former Eastern Junior High School/Purdue Educational Center. The locker room for the gymnasium at the former Eastern Junior High School/Purdue Educational Center. The basketball court in the gymnasium at the former Eastern Junior High School/Purdue Educational Center. The former school acutally had two gymnasiums. The basketball hoops still hang in the gymnasium at the former Eastern Junior High School/Purdue Educational Center. The former school acutally had two gymnasiums. A look at the basketball court at the former Eastern Junior High School/Purdue Educational Center. 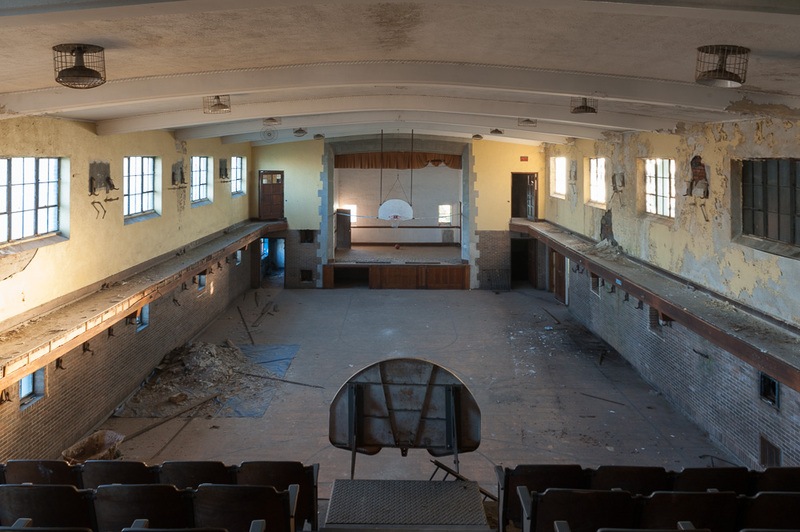 One of the gymnasiums at the former Eastern Junior High School/Purdue Educational Center. The auditorium seating from the stage. A look at the stage and seating in the auditorium. The cafeteria at the former Eastern Junior High School/Purdue Educational Center. The exterior of Webster Elementary School. Children toys still sit in one of the classrooms at Webster Elementary School. A look down the main hallway and classroom entrances at Webster Elementary School. Many of the school supplies and furnishings were left behind at Webster Elementary School. A look a the former computer lab at Webster Elementary School. A classroom full of old, broken printers? Chairs line up at the front of this classroom. A look at the cafeteria tables inside the auditorium and gymnasium at Webster Elementary School. Chairs are stacked on a table in the gymnasium at Webster Elementary School. The auditorium/gymnasium combination room at Webster Elementary School. The cafeteria was located on a raised platform that surrounded the gymnasium/auditorium. Webster Elementary School had an auditorium and gymnasium combination room. A look at a climbing net in the gymnasium at Webster Elementary School. A piano and the climbing net that was in the gym. A look at the chairs and other school supplies that were left behind in the gymnasium/auditorium at Webster Elementary School. A look through the climbing net in the auditorium/gym. A look down toward the entrance into the gymnasium/auditorium at Webster Elementary School. The arched-doorways in the main entrance into Webster Elementary School. A close up of the original, wooden arches in the main entrance into Webster Elementary School. Student art work still hangs in a classroom at Webster Elementary School. An exterior stone, flower pot at Webster Elementary School. The exterior of Parkman Elementary School. The hand-painted ceiling and magnificent detail in the lobby of the Fox Theater. The main entrance stairway leading to the auditorium of the Fox theater. The gorgeous plaster faces that overlook the auditorium at the Fox Theater. The chandelier at the Fox Theater. The famous artists signature wall backstage at the Fox theater. The podium on the Fox Theater stage. The “AUDITORIUM” entrance at Gethsemane Lutheran School. The auditorium and gymnasium inside Gethsemane Lutheran School. The chandelier hangs above the auditorium seating at the Fox Theater. The auditorium had started to show some ugly graffiti “tags” at Southwestern High School by 2013. The stone detailed faces and lions in the Fox Theater. The swimming pool had started to show graffiti and ugly “tags” by 2013. The gorgeous auditorium of the Fox Theater. The biology laboratory at Southwestern High School. The science classroom at Southwestern High School. A supply case in the science classroom at Southwestern High School. The chandelier hangs from the ceiling at the Fox Theater. The interior walls of the auditorium at the Fox Theater. The balcony seating in the auditorium of the Fox theater. The “TELEPHONE” booths inside the Fox Theater. The detailed fireplace at the Fox Theater. The gorgeous fireplace and Pewabic Pottery glazed-tiles in the lounge and restroom area at the Fox Theater. A look inside one of the classrooms at Wilkins Elementary School. The ticket booth and attraction advertisements in the entrance to the Fox Theater. Some musicians adorn the auditorium wall at Wilkins Elementary School. The “W” for Wilkins Elementary School on the curtain of the auditorium stage. A mural of Michel Jackson and other famous musicians was painted on the auditorium wall at Wilkins Elementary School. A look at the granite columns and the chandelier inside the Fox Theater. The stained-glass windows and granite detailed columns at the Fox Theater. A close up of the details inside the lobby at the Fox Theater. The computer lab at Wilkins Elementary School. The main entrance leading into the Fox Theater. The main staircase, beautiful columns, and chandelier hang in the Fox Theater. A “TEAMWORK” mural in the main hallway of Wilkins Elementary School. The magnificent, hand-painted ceiling in the lobby at the Fox Theater.